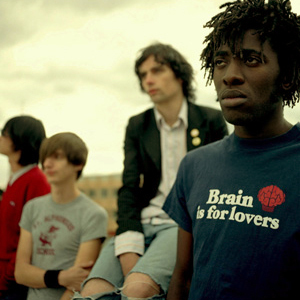 Bloc Party are an English indie rock band. In 2005, the band released their critically acclaimed debut album Silent Alarm. Their second studio album, A Weekend In The City was released on February 5, 2007 in the United Kingdom and February 6 in the United States. A third album, Intimacy, was released in August 2008 as a download and later as a CD release on October 27. The band's fourth album, Four, was released on 20 August 2012. The band consists of Kele Okereke (vocals, guitar), Russell Lissack (guitar), Gordon Moakes (bass, vocals) and Matt Tong (drums). In 2003 they changed their name from Union to Bloc Party. The name is a play on block party, a name for an informal neighbourhood festival, which might hire a local band as entertainment. The band have said that the name was not intended to be an allusion to the Soviet Bloc or the Canadian political party Bloc Qu?b?cois; the absence of a 'k' is purely for aesthetics. On 11 July 2012, the band released "Octopus", the first single from their upcoming fourth album "Four". The album will be released on 20 August 2012. *The track "SXRT" is the leaked version of "SRXT"
* The band's live television d?but was "Helicopter" on the Later with Jools Holland show. In the US, their live television d?but was on the Late Show with David Letterman, playing "Banquet". * The track SRXT was featured on the episode "The Other Side of This Life (Part 2)" of Grey's Anatomy.